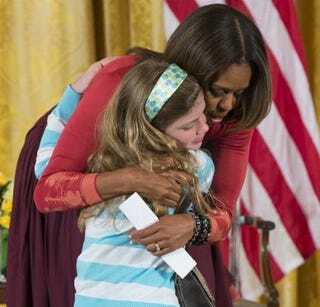 Michelle Obama hugs Charlotte Bell, 10, after she gave the first lady a copy of her father’s resume. Charlotte’s father has been out of work for three years. A 10-year-old girl took her chance to try to help her father out during the White House’s Take Our Daughters and Sons to Work Day. During a question-and-answer session Thursday with children of Executive Office employees, Charlotte Bell told Michelle Obama that her dad has been unemployed for three years. Then she handed the first lady his resume. After the event was over, Michelle Obama gave Charlotte a hug and took the resume with her as she left the East Room. Charlotte's mother, an executive branch employee who didn’t want to be identified, told AP that the family didn’t know their daughter was really going to go through with what started as a joke. Over the weekend, the family tossed around the idea of the little girl making a job pitch for her dad, Ben Bell, who had been looking for a job with the Obama administration.